The frigid temperatures we’ve been getting lately are the perfect excuse to visit a coffee house. Luckily for you, we’ve compiled a list of the five nearest coffee houses for you! McKenzie Messer (’15) is the columns editor and staff writer for the Viking Vault. Lilly Chesser (’15) is a staff writer for the Viking Vault. 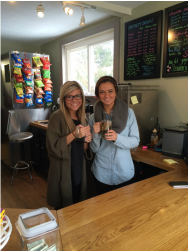 Photo caption: Hannah Young ('15) and Amelia Kyle ('15) work together at Ragamuffins. Savannah: What do you think about the most popular backpack for women is today? Megan: I’m not sure, but what I do know is that I see the Pink, Victoria Secret backpacks on the backs of all the chicks. The bags come in many patterns and show how fierce and awesome the lady is! Savannah: My personal favorite backpack is the sequin. If you’re feeling saucy, then flip the sequins over to red, and if you’re looking for a more elegant style, you can turn to sequins to silver with the flick of a hand. Megan: I, for one, find the themed backpacks grab my eyes. They are a wonderful look into what the wearers' interests are! Oh, hey! Look over there ... McKenzie Messer is sporting a awesome Tangled backpack! Savannah: What if someone was afraid their backpack reflected no personality at all? How would you suggest spicing up your backpack? Megan: Well, there are many things that you can do to accessorize your bag. I, for instance, clip a cute little hand sanitizer to one of the zippers of my bag! They are helpful AND adorable! Look who’s strutting down the hallway now, its Mat Scott wearing his satchel backpack. What does this backpack say about his personality, Savannah? Savannah: Well, the side bag is not only a fashion statement, but an obvious choice for the serious student. It says that he is a practical man, and all of his supplies are within arm's reach. What about Chris Brown, carrying around his items in a gym bag? What does that mean? Megan: It means that he is fierce, and better yet, cannot be tamed. The simplistic backpack just wasn’t edgy enough for him, so the gym bag is an obvious choice considering his rebel swagger. Savannah: We better hurry so we’re not late to class again. Mrs. Garee thinks tardies are intolerable. To find out what your backpack says about you email a picture of you and your backpack to savannahhope4@gmail or megansnewspaper@gmail. Savanna Legg ('16) is a Staff Writer for the Viking Vault. Megan Dalton ('16) is a Staff Writer for the Viking Vault. NORTHRIDGE- “Let’s play football!” The cheer many Northridge students yelled while laughing at the last basketball game against Johnstown. While many know this cheer was a joke, it’s a chant the two student sections yell when they get the chance during one of the many rowdy games between Northridge and Johnstown. The Northridge Johnstown rivalry started in 1962 when Northridge became a school. Ever since then the rivalry has just continued to grow. “I love the rivalry. It definitely helps make many high school memories and friends from a school that is two minutes away from you,” says Johnstown sophomore Tori Helmke. Denny Morris, who has been around the school for many years says, “The rivalry between the two schools has always been good, clean and competitive. It’s what a rivalry is all about.” As the girls basketball coach, Morris said he never lost to Johnstown, and that will always be one of his best memories from the rivalry. “LETS GO O!” is usually one of the cheers you hear from the roaring student sections during one of the many intense games between Northridge and Johnstown. The night of Northridge and Johnstown games bring in both school’s largest student sections for the season. The students go all out in preparing for the game. 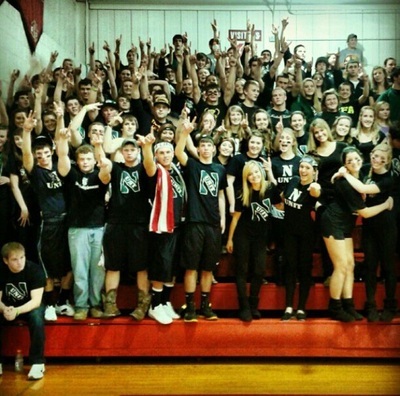 Many common themes for a game between the two schools include Black out, White out, and Green out. Along with students, many people who just live in the community and have no relation to any of the players come too. The gym is packed and crowds are loud. “It’s kind of like the whole town shuts down for the night when we play," says Helmke. While many schools' rivalries are in sports and nothing else, Northridge and Johnstown don't just honor the competition on the field or court. The two schools compete in food drives also. All the canned goods collected go to the Northridge-Johnstown pantry. The school that wins the food drive gets what everyone wants, bragging rights. “I love canned food week because it’s a fun competition between the schools and were doing something good for the people in our community,” says Savannah Legg ('16). Many Northridge and Johnstown students love the rivalry and only hope for it to continue to grow for the students to come. Jamie Swickard ('16) is a Staff Writer for the Viking Vault. 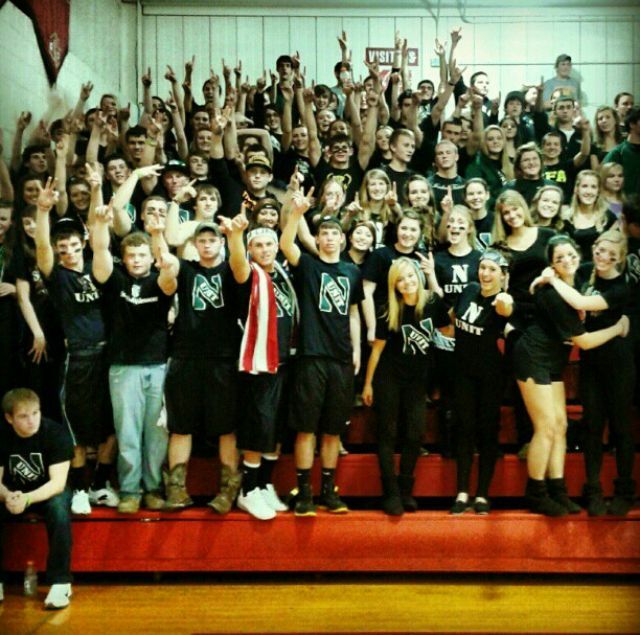 Photo caption and credit: LEFT: The Northridge N-Unit student section is pictured here from their Instagram page. 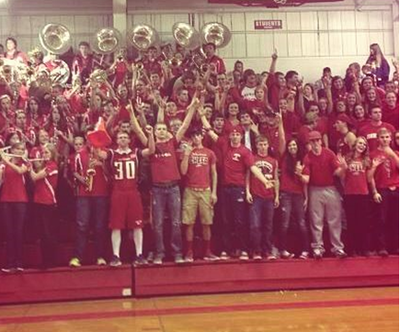 RIGHT: Johnstown's student section is pictured here, photo courtesy of Tori Helmke. 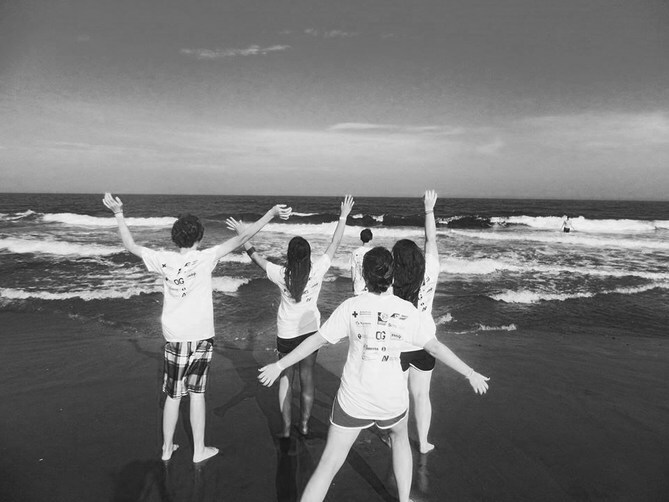 Above: Mission Trip in New Jersey. Left to right: Daniel Neff, Kayla Jasper, Amber Dunkle and Emily Dalton. With all the crime, hate, bullying and depression in the world nowadays, Kayla Jasper, junior at Northridge high school, is on a mission to change the world one student at a time. Jasper’s goal is to see more positive attitudes and more of thinking about others rather than just thinking of themselves. She says that all she does is invest in people and make people feel like they are cared for and it makes all the difference. She has already reached out to 20+ people and invited them to her home church, Jersey Baptist. She’s also invested in making our foreign exchange students feel homey and welcome when no one else had the courage to do so. Jasper firmly believes that, “all you have to do is give them a chance. You never realize how much something can affect someone’s life in a positive way. A simple sentence or even a compliment could turn someone’s whole day around.” And by following these beliefs Jasper finds out you can learn so much interesting things about people just by spending a little time on them and making lifelong friends in the end result. Sipes comes in again with a few insightful words, “this is how leaders are built... Strong in their convictions, secure of their purpose and unshaken by the attacks of the world." And as Jasper committed herself to others her peers began to take notice, her friends wanted what she had. "One person can make all the difference, and it only grows from there. Kayla is a prime example of how everyone should treat one another, selfless and considerate," said Megan Hatfield ('15). "If we would all follow more of these principles, Northridge would grow closer in closer in unity." Katelynd Havice ('15) is a Staff Writer for the Viking Vault. NORTHRIDGE- This year Northridge has welcomed a new academic extra-curricular, History Club, to the school. The History Club has had many meetings discussing different time periods and types of history. The group, designed for anyone who enjoys learning about the past, meets on most Monday nights from right after school until around three. The club has no specific set-up for what topics or time periods they will discuss. Together everyone throws out ideas about things and gets a discussion going. Steven Krehel ('15) started the group out with talking about early Roman, and Greece politics. E.J Cox ('15) then made a power point discussing different war tactics throughout history, and the social sides of war. Lilly Chesser ('15) did a presentation about Art in early Europe. From there, the club just worked their way up to the Napoleonic Wars, and then World War 1. Many times people write questions and topics of interest on the board, and then the meeting will start from there. The club tries to focus of all aspects of history. They discuss the social, political, and economical parts of time periods, and how they affect each other. Krehel has encouraged people to propose new ideas, research and even debate. Krehel organized most of the club as an offshoot of the Even Greater Day to be a Viking Project in College Prep English 11, and he serves as the group's leader. Aili Barbee ('16) says, "It's interesting, and I learn a lot. The only negative thing is it's hard because everyone is in different history classes, so some people know a lot more than others. It's a good activity to be involved in, though." The club covers a variety of topics because everyone has different ideas. The club is small right now but is trying to get more people involved. Megan Hatfield ('15) is the Features and Photos Editor for The Viking Vault.